This new number of 177,000 ways was found by adding all of the possibilities of tying a tie with the narrow end, instead of the traditional way of tying it with the thick end. They came up with some algorithm that would count the number of ways a tie can wrap around itself. I’m sure only about 30 of the 177,000 actually look good! I also don’t think they’ve account for twisted knots like the Truelove Knot or the Wess Knot. What do you think? 85 ways to tie a tie? I think not. I finally twisted some fabric around into something fairly beautiful. I liked the Onassis Knot but it felt a bit lacking. I definitely like the wow-factor and how it almost looks like a piece of fabric connected to nothing. I was playing around with this tie and came up with an alternative that is similar to the Onassis Knot but has some nice decoration along with it. I don’t have a video for this yet, but this will be my first instructional video. It’s fairly simple, obviously, but it starts like the Pratt Knot (inside-out) and has a middle kind of the same as the editety knot. the second-to-last step has the narrow end infront of the large end, then it flips over the whole knot and rests there. Believe me, I will film it for you! I’ve finally created my own how-to video! This is my first. Please, please expect them to get better! Different angles, lighting, etc., etc. As always, leave me a comment and give me suggestions! I found this tie at a department store somewhere. I just found it and a couple others and bought them up for a good price. This is a fairly thick tie with some good thick construction. It’s not the greatest though. The innards sometimes fold up and you have to move the stuff around, but it always goes back to normal. This knot is a nice and easy knot for any size tie; thick or thin, long or short. It’s tied like a normal tie, with the large end twisting about. 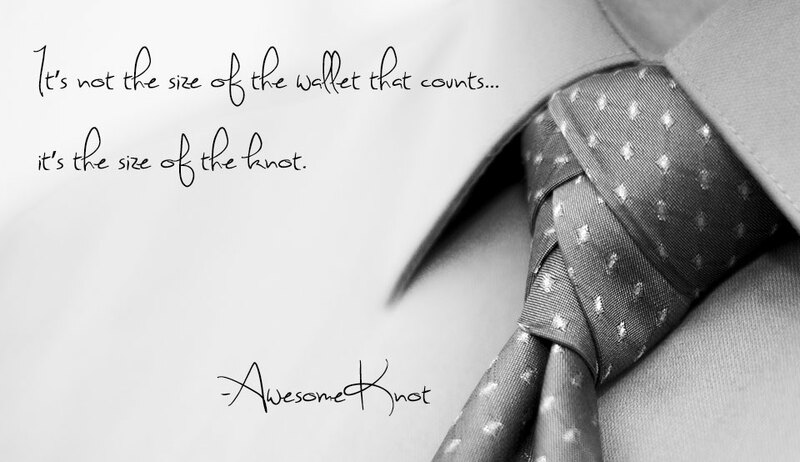 This knot is perfect with a thinner or highly tapered tie. The key to this look is making sure the two sides are showing under your lapel and the top of the tie is not covering them either. Otherwise, you’ll just be wearing the Onassis Knot. Do not try and bend the spoon. That’s impossible. Instead… only try to realize the truth. If you haven’t already guessed, the Ediety Knot was made famous by the mind bending movies “The Matrix Reloaded” and “The Matrix Revolutions”. In the movies, The Merovingian (or The Frenchman) wore this knot and really made it look classy, though this knot has been around since before then. The knot looks great when you wear it right. Please don’t get this knot confused with the youtube video Matrix Reloaded Tie Knot Instructions Ediety Knot or Edietty.com‘s knots. they are a bit backwards from what the true Ediety Knot looks like. If you’re wondering, with the Ediety Knot, the narrow end ends up in the front of the tie. A proper instructional for this knot Is Here. You’ll notice he ties this knot backwards and you can see at the end of the video that the narrow end of the tie is infront of the thick end. Now, what I mean by wearing it right is this: This knot is made to wear with a vest or a high buttoned suit jacket. The purpose of this is because the narrow end of the tie looks a little awkward when it’s just hanging loose. Our society has taught us that a narrow end of a tie needs to be behind the wide end. That’s why it looks a little strange. When the vest or jacket covers the bottom of both ends, it looks more uniform and purposeful and you really don’t realize what’s going on. Another thing I noticed was, when tying this knot, since it’s tied backwards, the upper portion of the knot will be showing the seams. I hope to fix this eventually for my instructional video once I do those. I believe I purchased this tie a while ago while shopping in some department store. Sometimes a man just needs a tie! It’s a Calvin Klein, 100% silk tie. It has a medium material thickness and is pretty well proportioned for a big guy like me. It’s not an extra long tie so I would certainly need a vest or jacket while wearing this knot. To get the extra long narrow end of the tie, I needed to choke up on this one which made the wide end of the tie much too short on my torso. A jacket was absolutely necessary for this one. The Ediety Knot is a very large knot and should also be fluffed which makes it even larger. This knot is definitely used as an eye catcher. It’s noticeable with any type of tie. Just remember, use a very long tie and cover the ends up with a jacket or vest. You should also be using nothing larger than a medium thickness of tie. When you get thick, you will start to get strange wrinkles in the knot which are hard to pinch out. Use a medium to thin tie and try to get extra long if your jacket doesn’t button high. Thin – Medium Ties – Thinner fabric and thinner width cause less wrinkles. Paisly/Patterned Ties – These patterns will have a great contrast with each other seeing as how we are layering fabric. Symmetrical Patterns – Light patterns are better for this. The heavier the pattern, the less you’ll be able to see the great knot. Striped Ties – Striped ties look great with the layered fabrics. especially if there are different colored stripes. It really brings out the narrow end. 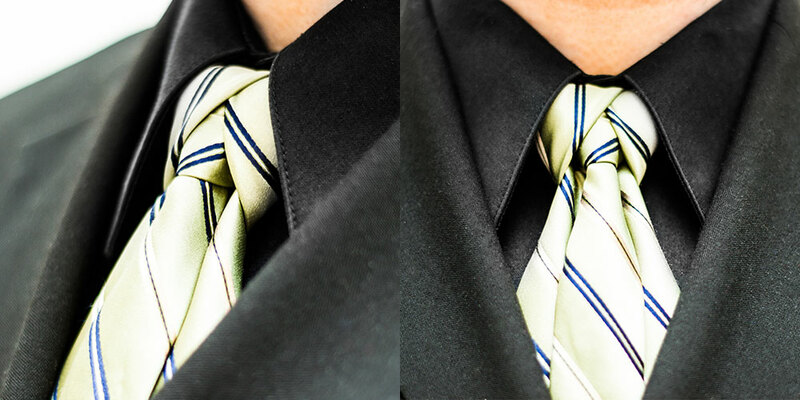 Thicker Ties – Thick fabric and wide ties make this knot give the tie too many wrinkles and divits. Solid Color Ties – Solid colors technically work, but there won’t be much contrast in the layered fabric. Plaid Ties – Plaid ties might hide this knot and style of tie. When you think of a Tie Knot, the Windsor knot is normally what comes to mind. There is a nice long history on the Windsor Knot. The quick and dirty is; The Duke of Windsor (or King Edward VIII) invented this tie knot, or possibly his father. The Wikipedia is here if you’d like to read up on it. Below is a side-by-side comparison of the two knots. As you can see they are pretty similar, though I feel the (full) windsor is a bit more symmetrical. The only difference, technically, is that there are only two more ‘moves’ to create the (full) windsor knot. When you watch videos or see instructionals of the half-windsor knot, you’ll notice a couple missing steps. With the (full) Windsor, you would have to wrap the tie around a section one more time, then around the front. This second wrap is what makes the tie more symmetrical. By the way, when I say “(full)” I’m referring to the larger, “full” windsor knot and not the half-windsor. Saying “Full-Windsor Knot” is a bit redundant. The windsor knot is already the “Full” knot. whereas the half-windsor is an easier knot with a proper title. The real comparison is not necessarily the way the knot is tied, nor how the knot looks – since they are almost identical – It’s actually more about the type of tie you use, what your body type is and what kind of suit, if any, you’re wearing. As a general rule, large men shouldn’t wear skinny ties, and vice versa. If you’ve ever heard of The Golden Number or Phi, you might have an eye for perfection and you might know proper proportion. I won’t get into a lesson now, so read up on it here. The Windsor Knot is to be used on a larger man with nice thick ties. It is meant to be a large symmetrical knot. Another good use for this knot is to hide unbuttoned top buttons. If you find that you have a shirt collar that is too small and the top button chokes you, you can use this nice large tie knot to cover that up. Just remember, you should be using a thicker tie, otherwise, you might as well use the half-windsor knot. This knot is meant to be large. Large guys, you should make sure to try to find an extra-long tie because this knot takes up a lot of fabric. 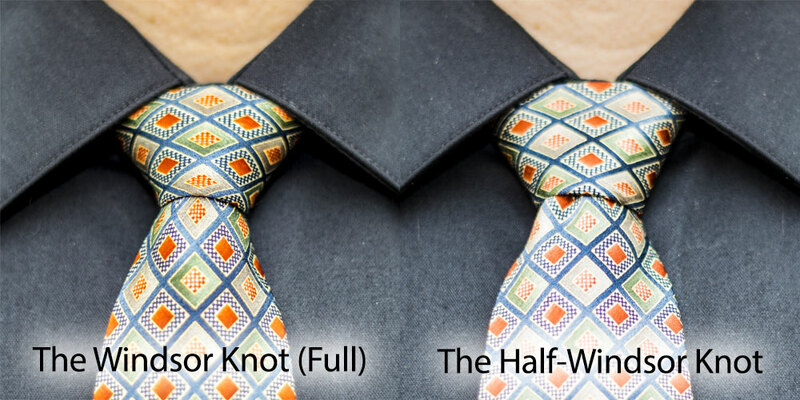 The Half-Widnsor knot is made for the sleek, tall, thinner or fit man. It should be used with a medium to thin tie with a sleek fabric. This knot is not meant to cover open top-buttons, though it can be used well on wide collar drapes, whereas the taller/thinner four-in-hand knot is used well with uptight collar drapes. Either knot are great if you’re looking for the ‘classic’ triangular look. Nothing too fancy here, but in normal circles, when done correctly, can help you gain the respect you need. So depending on your body type and the type of tie, size DOES matter. Thank you Mr. Truelove. This knot is an excellent addition to the repertoire. Though this knot has nothing to do with “True Love” – as far as I can tell – I’ve used this knot for Valentine’s day this year. we can thank Mr. Elliot Truelove for this one. This knot is unique in the fact that it has a four sided cross in the center of the knot. This would usually be hard to accomplish with most ties having lines divisible by three, but Elliot Truelove found a great way to defy the odds. He also took a notice of Alex Krasny and wanted to do what I am currently working on; to create a new knot. 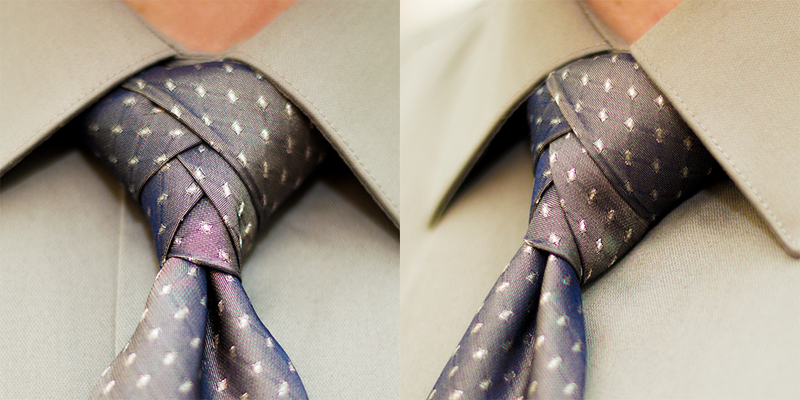 Take a watch of Elliot’s how-to video and follow along to make a knot like this. I have to give a huge shout-out to my wife, Ari, for this beautiful contrasting tie. She supported and encouraged a job change. With that job change came a more corporate attitude. I had to grow up! The weekend before my first day, she took me out on a shopping spree and this is one of the beautiful ties that she got for me. It’s elegant and simple with a HUGE contrast in color. (Please don’t tell me it ‘pops’. Ever.) The shirt was purchased at the same time, though they weren’t in a package together. It worked out beautifully. The tie is an Arrow, 100% silk tie. It’s in the medium range of thickness, which I felt was appropriate for this knot. It’s all pretty standard, though a bit more narrow at the large end than many of my other ties. It was easy to maneuver and the edge creases did not creep out (like the Repp Tie). Thinner Ties – Thinner fabric and thinner width cause less wrinkles. Solid Color Ties – The solid colors give this knot the attention it deserves without distracting from the knot itself. 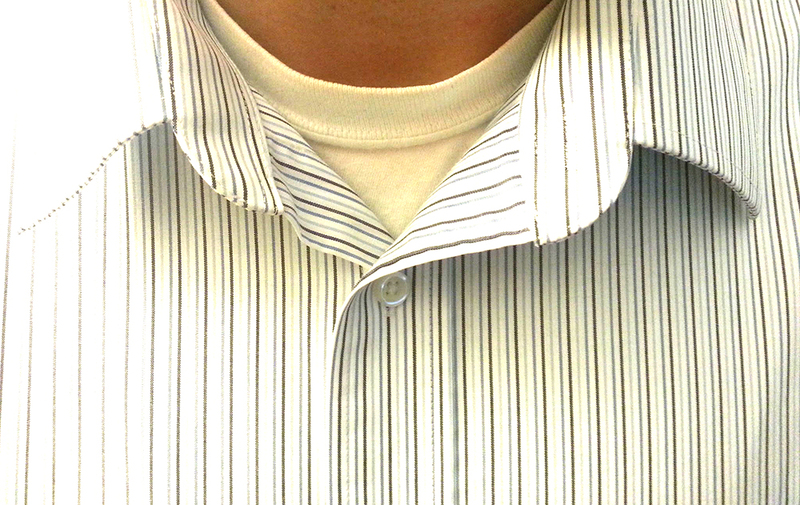 Striped Ties – If you have a striped tie, make sure the stripes are at a normal interval (unlike the one above). This will make a great diamond pattern in the center. 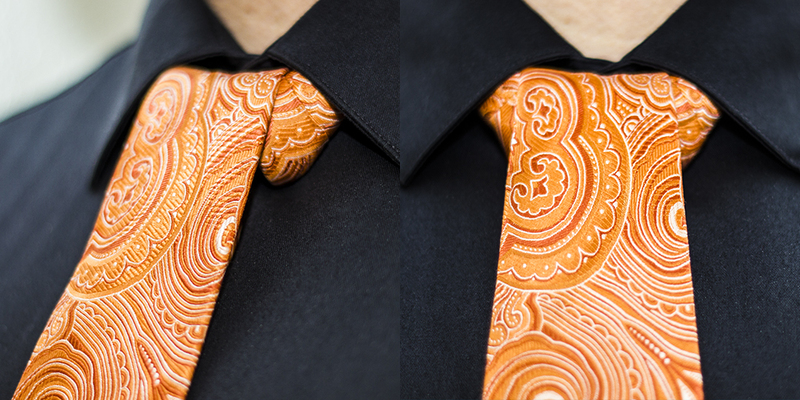 Paisly/Pattern Ties – This is a possibility. I usually say these detract from the knot, but I believe the compass cross could work well with them. Plaid Ties – Plaid ties might give a great diamond pattern, but along with that is another set of crosses. Could be good – could be too much. If you haven’t already heard of this one, It’s called “The Trinity Knot”. For reasons unexplained… (Besides the fact that it shows three intertwined sides… Origin here) …It got it’s name for having three woven pieces. This knot is the second knot I have tried in my new neck tie hobby. It was pretty simple to learn, though fairly hard to master and get to look right. Once you get the loose concept, it’s all about finding the right tie. I started this journey when I looked up the proper way to tie a full Windsor knot. I stumbled across this guy: Alex Krasney. He is the inspiration behind me wanting to tie knots and make some of my own. You will notice a few of my first knots are actually learned from him. Thank you Alex! I hope to make a couple instructional videos of my own. Until then, follow the link to his name and you can see how this is done. I would like to thank my Sister, Corinne, for this tie. She gave it to me as a gift for Christmas a few years back. It’s a gorgeous green Tiffany’s Tie. It has almost a carbon fiber look to it, which I really enjoy. The fabric on this tie a bit thick for this knot… that’s my excuse, anyways, for the sloppy knot, but I had to have this knot in this color. Thanks Cory! Striped Ties – When the stripes all go in the same direction (straight or diagonal) they make a great pattern in the center of the knot. Paisly/Pattern Ties – The patterns greatly reduce the visual appearance of many fancy knots. This is one of them. Plaid Ties – While this sort of works as a striped tie, the counter-hatched stripes seem to confuse the eye a bit too much. This is the knot of all knots. It’s a great eye catcher and has become my favorite knot to date. I’d like to tell you the history and an awesome story behind this knot, though I am unsure of the origins. Google let me down… It’s just a great looking knot and really a conversation piece. This knot is what started my little hobby here. I found this, again, from Alex Krasny while I was looking for instructions on a proper windsor knot. I saw a little thumbnail of it and I just had to know and understand how the knot worked. I was extremely impressed and learned it right away. I will be making instructional videos soon, but until then – Watch Alex. I can thank my Dad for this tie. I was back home for a family function, had this nice gray shirt, but no good tie to go with it. When I was ironing this shirt in my parents room, I noticed the tie hanging in the closet. I asked if I could use it and it turned out to be absolutely perfect. I tied my half windsor and wore it to our family function. It’s a great, 100% Silk, Hand-Made, Extra-long tie from Repp. 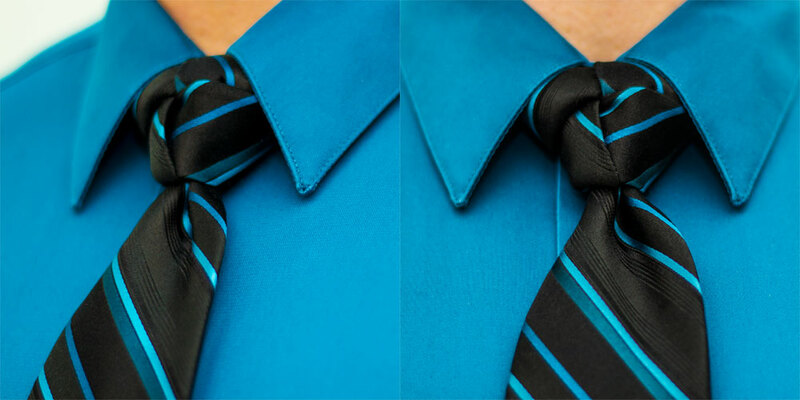 The tie isn’t extremely thick, which is perfect for this type of knot. Paisly/Heavy Pattern Ties – The patterns greatly reduce the visual appearance of many fancy knots. Plaid Ties/Striped Ties – The stripes or plaid will severely diminish lines of the knot. Hello and welcome! This is just an intro post to the tie knot blogging world! I hope to be able to inspire and help those of you who want to be a little more interesting. Soon, I will be posting different tie knots and possibly instructionals on how to do them. I am still thinking out this entire thing!